The holiday season tends to shift one little part of the house into focus that fades into the background the rest of the year: the mantel. As a home improvement website editor, I’ve seen so many gorgeous and delightful traditional mantel decorating ideas that I just have to share them with you. Whether you are looking for a way to turn your mantel into the focus of a room throughout the year, or if you just want to dress it up for the holidays, these five mantel decorating ideas are sure bets with high, but understated and always appropriate, style. 4. All About Art: A stately, framed piece of art, displayed alone or with decorative accessories, is conservative but timeless, and perennially attractive. In this case, the frame is as important as the art. Don’t have money for an original? Buy a high-quality print. The frame should be hefty, and classically styled, and of a high-quality wood. Center and mount the framed art on the wall above the mantel. A centered, classic picture light installed above the framed art adds a distinguished touch. Last, accent the art with a decorative accessory or small statue on the mantel. If you are choosing a statue, place it on the right side of the mantel, angled slightly inward. A china display is also a classic look. Flank the art with large matching china urns on the outer edges of the mantel. Inside the urns, in the center of the mantel, place a small decorative china urn, and flank that with two larger decorative china plates on stands. Stodgy? Maybe it is, but it is definitely a timeless classic mantel arrangement. 5. Flower Power: Fresh flowers pop in a line of skinny vases in front of a large framed mirror. For this mantel arrangement, you’ll be hanging two wall sconces and a large framed mirror above the mantel. Hang a large rectangular mirror (about 2/3 the width of the mantel) at the level of the mantel. You could even just place it on the mantel and lean it against the wall. Be sure that the frame is of a stately design, made of either antiqued metal or a sturdy wood. On both sides of the mirror, in between and equidistant from the vertical lines of the outer edges of the mantel and the outer edges of the mirror, hang matching wall sconces, either fitted for electric lights of candles. In the center of the mantel, in front of the mirror, line up a large group of short, skinny vases or cups. Fill them with fresh flowers according to the season. I hope that I’ve sparked your interest in mantel décor. 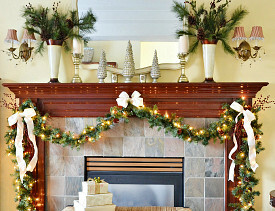 For mantel decorating ideas from DIY bloggers and interior designers, go to Hometalk.com, and search for “mantel”. You’ll find photos and ideas from some of the best design bloggers on the Web.